Good news, bad news, good news. Let’s start with the bad and then go to the good. 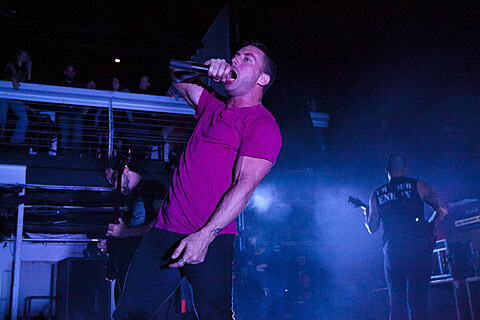 The RSVP for the Dillinger Escape Plan show at Music Hall of Williamsburg on April 27 with The Faceless and Royal Thunder has run dry. That said, we have a pair to giveaway to a lucky individual, details on how to get into this Converse Rubber Tracks event are below. In addition, DEP has announced that they will headline the Summer Slaughter festival for 2013, snagging support from Animals As Leaders, Periphery, Norma Jean, Cattle Decapitation, The Ocean, Revocation, AEON, Rings of Saturn and Thy Art is Murder. Though dates as a whole have yet to be revealed, look for that lineup to play House of Blues in Los Angeles on July 20 and Best Buy Theater in NYC on August 7. Tickets for the latter go on sale April 19 at noon. Contest details and song streams are below. For a chance at winning a pair of tickets to The Dillinger Escape Plan at MHOW: either tweet something that includes @rubbertracksnyc, @brooklynvegan and “43% Burnt” in the tweet, or send an email to BVCONTESTS@HOTMAIL.COM with the subject line “43% Burnt”. Include your first and last name. We’ll pick a winner at random and contact them with more details. If you enter by email, it will not be shared with anyone else. Good luck!